During Janmashtami, navratri and maha shivaratri, many people keep fast. 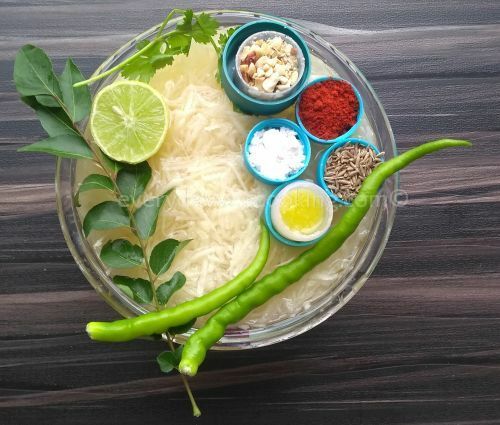 During this period, people make various delicious fasting dishes with specific food items such as sabudana, kuttu, singhada, rajgira, potato, sweet potato, milk, curd, khoya, paneer, fruits, and dry fruits, etc. Today I am sharing the recipe of aloo ki khichdi which I learned many years ago from my badi dadi (Smt. Purushottami ji Laddha). I still remember when she used to make aloo ki khichdi its irresistible tempting aroma use to engulf every corner of the house. Spicy and tangy aloo ki khichdi is the perfect comfort food during fasting days because it is easily digested. Try this recipe, I am sure you will love the soothing combination of grated potatoes and crushed peanuts tossed in desi ghee along with red chilli powder and salt. I prefer to make aloo ki khichdi in a nonstick pan or kadhai because this prevents the grated potatoes from sticking. Sendha namak (rock salt ) according to taste. Rinse, peel and grate potatoes. Soak grated potatoes in water, this will remove excess starch and prevent potatoes from decoloration. Just before making khichdi, drain potatoes in a strainer and squeeze water from the potatoes. Chop green chillies into small pieces. Heat desi ghee in non-stick kadhai. Add jeera, and when it sizzles, put curry leaves and green chillies. Saute for a few seconds. Now add grated potatoes, sprinkle salt and red chilli powder, mix well. Cover the kadhai with a lid and cook for 8 to 10 minutes, occasionally keep stirring. Now add sugar and crushed peanuts, mix well and cook for one more minute and switch off the flame. Squeeze lemon juice, mix it and transfer aloo ki khichdi to the serving bowl. Garnish it with fresh coriander leaves and serve it immediately. With grated potatoes…it seems something different. Shall try . Thanks a lot Ranjana ji, this is one of my favourite fasting dish please try this recipe I am sure you will like it . 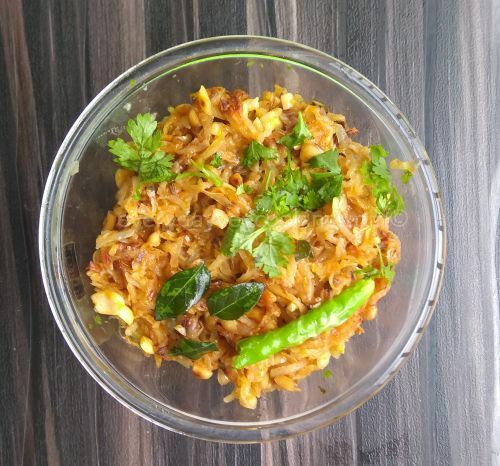 It is one of your easy recipes 😀 This is very similar to batata kees that Maharashtrians make. They also use sweet potatoes to make this kees. This recipe is very simple and easy. Some times I make sweet potato ki kees also but aloo ki khichdi is my favourite.